My very first advise to you when making a risotto is to not even think about it unless you have a great stock to cook it with. Your risotto will only taste as good as your broth, so if you use those powdery mixes or even worse, those salty cubes full of chemicals, that is the flavour you will impart to your rice. 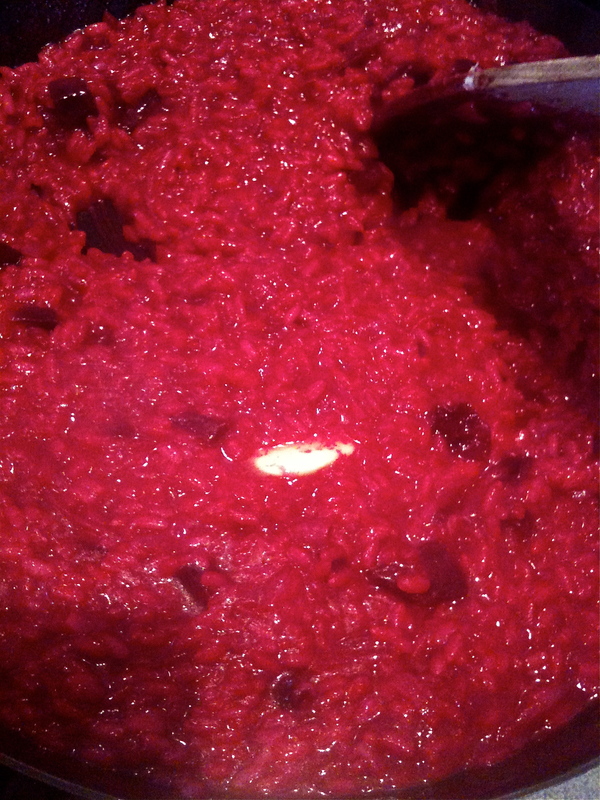 Since risotto is a bit labour intensive, it really not worth it unless you are going to show it a bit of love. Recently, I poached a chicken with garlic, tarragon onion and carrot with the intent of eating the meat with steamed potatoes and of using the stock for a risotto. It’s winter here in Australia and it had been raining for days in Sydney and last Sunday I felt like I needed to colour the day a vivid red. 1. Cover the beetroots in foil and roasted them in a hot oven for about 1 hour. Peel them and puree them in a food processor with a little salt and extra-virgin. Set aside. 2. Stir fry gently the diced onion in olive oil until tender. Add your Carnaroli rice and toast with the onion until translucent. Be mindful to stir your rice well. 3. Add a glass of dry white wine and allow for the alcohol to evaporate, stirring occasionally. Turn the heat down and start adding the stock a ladleful at a time, while stirring gently. 4. Keep adding stock until the rice is cooked, this will take around 18 minutes. 5. Turn off the heat and add the beetroot puree, a generous dusting of parmigiano and a little butter. Stir vigorously to release the starch and create the all’onda* texture. Cover with a lid and let it rest for a few minutes to create the perfect mantecatura, creaminess. The vibrant red put us in a festive mood and we felt urged to open a Prosecco to go with the risotto.